Stanley joined Generation Kenya in 2015. After graduation he got a job as a sales associate with Old Mutual. Stanley is one of eight children who was raised by a single mother in Nairobi. His family often struggled to find money for necessities like food and shelter. “All of us were raised in the slums – we have lived this life for a long time,” he says. Despite performing very well in school, Stanley was unable to afford university. Prior to joining Generation, Stanley worked odd jobs at a construction site and sold clothes to earn a meager income. It was difficult for him to find full-time employment because he lacked the necessary credentials. He still dreamed that one day he would work in an office for a great company but feared that it would be impossible without a university degree. 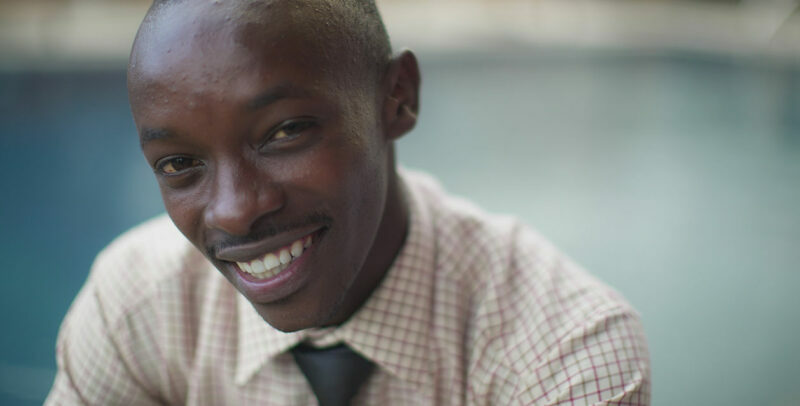 Upon graduation, Stanley received an offer from the financial company Old Mutual. “God was answering my prayers. After just 6 weeks I was in a good job as a sales associate. Generation was the platform for me to move from one step to the next. It was a real boost for me.” Stanley has a great relationship with his manager, who he describes as a brother and a mentor. Today Stanley is thriving and his job allows him to not only make money but also save for the future. He is supporting his entire family and helps pay his siblings’ school fees. Stanley still wants to continue his education: “Thanks to Old Mutual, I will get the money I need to go back to university.” He also hopes to put help pay his siblings through college and open an orphanage to help provide opportunities for underprivileged youth.